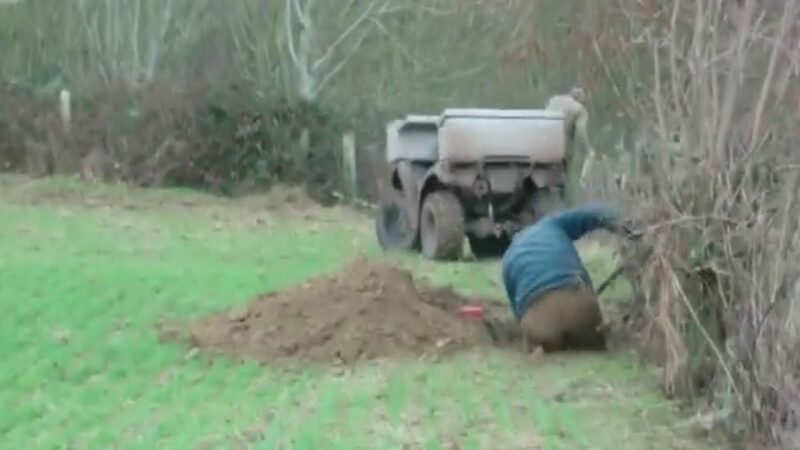 This is the shocking moment a huntsman was caught on camera appearing to dig out a terrier puppy from a badger sett which was sent in to flush out a fox. 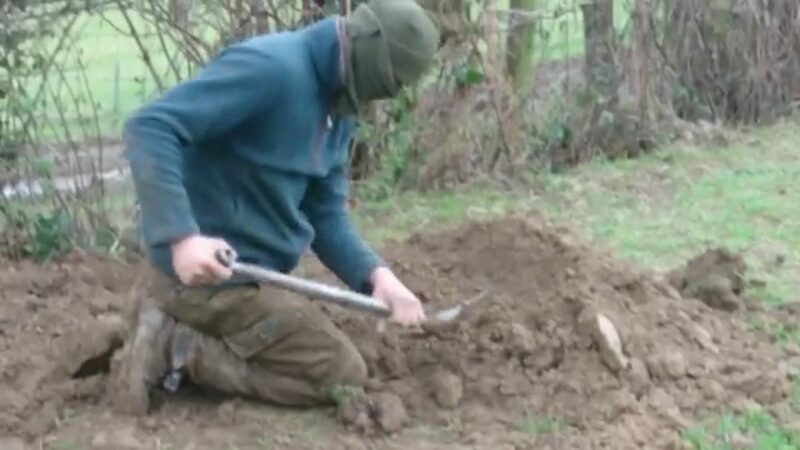 Hunt saboteurs recorded the footage of a balaclava-clad man digging into what they claim is a badger sett in a field in Ledbury, Herefordshire, on January 7. It is alleged the man was a ‘terrierman’ with the Ledbury Hunt who was illegally sending a hound into the hole in a bid to chase out a fox. A spokesperson for the Herefordshire Hunt Sabs said the intention was to block off exit points with nets and drive the animal into a woodland where hounds could catch it. The saboteurs claim the group quickly realised they had been caught red-handed and were desperately trying to retrieve the dog with the aid of a locator device. 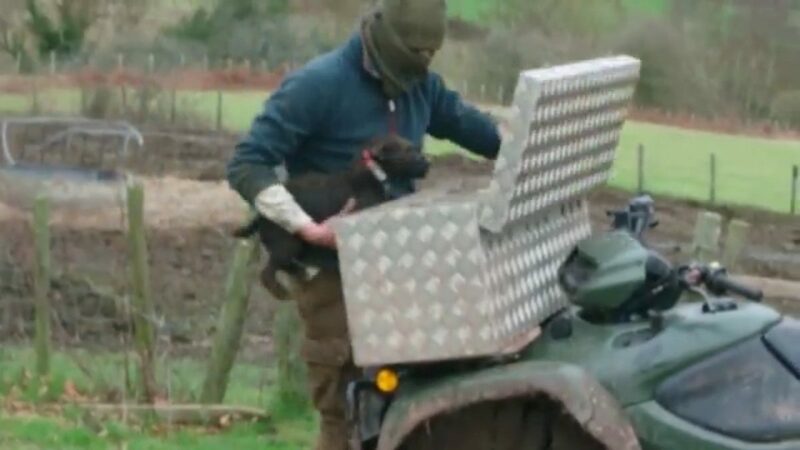 The 4min 20 secs video shows the man reaching into the hole and eventually pulling out a black puppy – which he stuffs into a metal box attacked to the back of a quadbike. 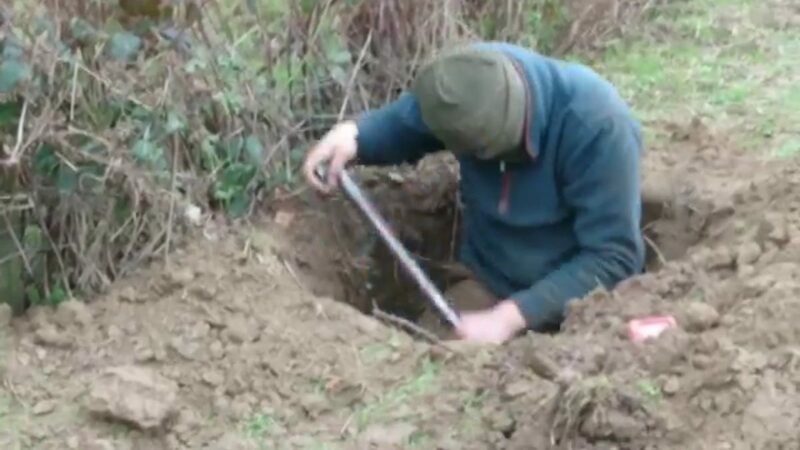 A Herefordshire Hunt Sabs spokesperson said: “While huntsman and hounds hunted through woodland nearby terrier men were caught digging out a badger sett higher up the valley. “Sett entrances had been blocked, a net secured over one remaining unblocked entrance and a large hole had been dug into the sett. “Realising they had been seen, the men retrieved the terrier that had been entered into the sett as quickly as possible and left the area. “The area around the sett smelled strongly of fox. When informed that they were illegally interfering with a badger sett the men claimed they were rabbiting. “Was their intention to flush a fox into the net and then release it in the covert just before the hounds arrived, providing some “sport” for the riders? Terriermen have been a traditional part of fox hunting and their role is to follow riders with their dogs, which can be used to flush out foxes hidden underground. Foxes will regularly occupy vacant badger setts and hunt supporters have been previously accused of illegally blocking them off to prevent the animals from escaping into holes while being chased. Since the 2004 Hunting Act, hunts are only permitted to ‘trail hunt’, which involves using a prelaid fox scent trail for hounds to follow. Despite the Labour government’s ban on fox hunting, Theresa May has said that she has “always been in favour of fox hunting”. Secretary of State for Environment, Food and Rural Affairs Michael Gove has so far refused to close loopholes in the law, creating an environment where fox hunting with hounds continues openly despite growing protests. A Labour Party petition to end the illegal practice for good has so far received over 179,000 signatures. Previous PostHow is this week likely to pan out?